Here it is, my beautiful Flukra. I cast off last night, a couple of minutes before 11pm, after just eight days of knitting. This has been one of the most enjoyable knitting experiences I have had so far. I bought the yarn in a lovely little yarn store in Gamla Stan last year while I was visiting Sweden. It is a lovely rustic wool, in a heathery shade that hovers somewhere between mid-grey and light brown. I wanted a shawl with more substance than delicacy, and I think this yarn has delivered exactly that — the snowflake lace seems far more modern and boldly geometric when knitted in this heavier weight. 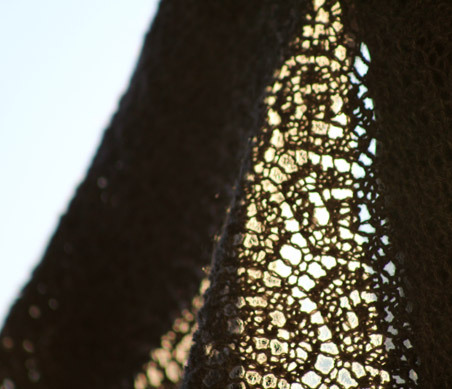 The pattern, by the very talented Gudrun Johnston, is beautifully written, and the lace itself is very intuitive once you get used to having to work yarn overs and decreases on both sides. This is not the sort of lace that can only be knitted when alone — I successfully managed to keep knitting through it even with the kids playing around me and while chatting with friends. And the end result is the sort of project that most makes me smile – one that is both beautiful and full of memories. Gorgeous! The yarn goes so well together with the delicate pattern!